In the year 1521 A.D. while on an Udasi mission tour, First Guru Nanak Dev and his minstrel companion Mardana stopped in Hasan Abdal of Punjab, which is now the home of historic gurdwara Panja Sahib in modern-day Pakistan. Guru Nanak and Mardana had been traveling in the heat of summer. They settled at the foot of a hill in the shade beneath a tree where they began to sing kirtan in praise of the divine. Local people gathered around to listen entranced by the sublime hymns. After the singing came to an end, Mardana expressed that he felt very thirsty. When he inquired where to obtain water to drink, he learned that a scarcity of water plagued the area. The only water available had been diverted by Hazrat Shah Wali Qandhari (Khandhari ), a ​wizer dwelling at the top of the hill who had a reservoir fed by a natural spring. Guru Nanak advised Mardana to walk up the hill, introduce himself, and request a drink from the wizer's well. Mardana set off on the long trek up the hill. The sun shone fiercely and his thirst increased as he plodded along the dusty track. When he reached the top he found the wizer waiting for him full of questions. "Who are you? Who are you traveling with? Why have you come?" Mardana answered respectfully, "I am Mardana, minstrel of the Mirasi lineage. I travel with the great Guru Nanak Dev ji of the Katri lineage, a saint empowered with spiritual blessings who is greatly respected by Muslims and Hindus alike. I play the rebab while my guru exquisitely sings in praise of the divine. We have arrived here after journeying to far places on a mission to bring enlightenment to all people of the world with my guru's message of "Ik Onkar," that creator and creation are one. I have come to your well with a request for water that we may quench our thirst." Mardana's answer greatly annoyed the wizer, a proud man who considered himself a prominent leader and holy adviser to the Islamic people of Hasan Abdal. He had noticed that his own followers had been congregating with the newcomers below and felt a passionate rivalry. He had made it his personal mission in life to rid the area of infidel unbelievers. Hoping that Mardana and his guru would leave the area, Wali Qandhari refused Mardana's request for a drink, taunting him, "Go back to your great guru. As he is not lacking in power, surely he is able to provide water for you himself." Mardana had climbed a kilometer, more than half a mile, to reach the well. He turned away dispirited and trudged back down the long hot dusty trail, his thirst growing with every step. When at last he reached the bottom of the hill, he told Guru Nanak all that had transpired. Guru Nanak instructed Mardana to go back up the hill and with utmost humility, to request water a second time, and to deliver a message from his guru saying "Nanak is but a humble servant of creator and creation, a wanderer come hither who seeks but a drink from your well." Obediently Mardana again climbed the path up the long hill. The wizer in no better a mood demanded to know why he had come back. Mardana replied, "My honorable Guru Nanak Dev ji, servant of God and minister to mankind, sends his greetings and well wishes along with his most humble request to drink from your well." Mardana's attempt at humility only further enraged the wizer, who impatiently ordered him to go back to his guru and request water only from him. Scornfully, he retorted, "Let the humble servant of God humbly administer water to mankind." Mardana had no choice but to go back down the hill without even a drop of water. He turned slowly, the stifling heat oppressive, his feet heavy. Clumsily, he picked his way back down the track and returned to where Guru Nanak waited. He told his guru, "The holy man on top of the hill has refused me again. What more can I do?" Guru Nanak advised Mardana to exercise utmost patience and insisted that he walk back up the hill to ask for water one more time. Mardana could not refuse his Guru. He turned around with renewed will and retraced his footsteps up the long arduous path to the wizer's abode. Qandhari could scarcely contain his outrage when he saw Mardana approach yet again and mocked him severely. "Have you forsaken your saint and come to fall at my feet? Renounce this Nanak and acknowledge me as your master and then you shall have all the water you wish." A spark ignited in Mardana's soul. He felt sorrow that a supposed man of God should be so lacking in compassion. He spoke thoughtfully. "O Wali Qandhari, renowned and learned one, can you please advise me, as to how many hearts one man has?" "Surely the servant of so great a guru must know that a man has one heart only," replied the wizer sarcastically. Mardana replied, "What you say is true, O holy man of the hill. So you must also know then that because I have given my heart and soul to the service of my guru, it is no longer mine to give to you. If I bow to you for the sake of water, this body would only be going through a motion forsaken of emotion. You are correct, only my guru has the power to quench a thirst such as I have. I am very sorry to have bothered you." Mardana turned his back to Wali Qandhari and quickly made his way back down the hill. When he reached the bottom of the hill, Mardana explained to Guru Nanak at all that had occurred, adding that he believed the wizer to be a lost soul with a heart of stone. Guru Nanak told his faithful companion, "Your body suffers physical thirst. Wali Qandhari has undergone many austerities and consequently acquired powers which serve only to increase his ego. He commands the people and controls all the water, yet he himself has a deep thirst which may only be quenched with spiritual refreshment. Let us see if by dislodging a single stone, such a heart might be transformed." While giving praise to the one source of all life, Guru Nanak probed the earth and removed a nearby stone. Water surged from the earth. Amazed onlookers rushed to collect more stones and form a tank to collect the pure sweet fresh water which gushed from the spring to flood the barren plain. Far up the hill, Wali Qandhari noticed that the reservoir fed by his well had begun draining rapidly. He saw the commotion below and realized what had occurred. In a furious rage, he summoned all of his supernatural strength. He pushed with all his might and hurled large boulder down the hill directed at Guru Nanak. The people below scattered as the boulder came clattering down the hill. Picking up speed as it rolled and bounced over the hilly terrain, the boulder launched into the air and hurtled towards the guru who sat calmly unperturbed. Lifting his arm Guru Nanak opened his fingers wide. To the amazement of all, when the boulder struck, Guru Nanak stopped it with his outstretched hand, yet remained completely unharmed. His palm and all five fingers left the imprint of his hand deeply embedded in the rock as though the guru's touch had caused the boulder to soften like warm wax. Just so, the heart of Hazrat Shah Wali Qandhari also softened. He realized Guru Nanak to be a true servant of humanity blessed with divine power and protection. The wizer came down from his hill and prostrated himself before Guru Nanak’s feet. Wali Qandhari proclaimed Guru Nanak comparable to a divine touchstone. He asked to be accepted as the guru's disciple and served Guru Nanak faithfully ever after, for as long as he drew breath. The spring Guru Nanak opened continues to provide pure water which flows from a natural fountain beneath the boulder where his hand print is embedded. 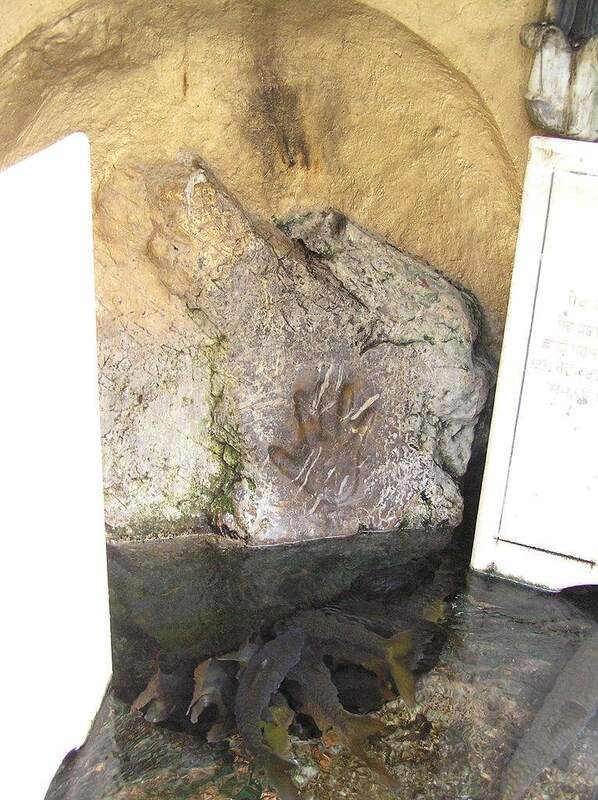 Despite attempts to remove it, the guru's handprint adorns the boulder to this day and can still be seen at the sarovar of Gurdwara Panja Sahib in Pakistan. In beloved memory of the late Bhai Rama Singh of the UK, author of In Search of the True Guru (From Manmukh to GurSikh) who inspired this telling.